A region with about 200 kilometers (124 miles) of golden sandy beaches and crystal clear waters, which create shapes in the rocks and cliffs. The aromas and flavours of the traditional cuisine of Algarve, gifted by the mountains and people. The regional delicacies, such as figs, almonds, carob and the arbutus-berry brandy, distract us from the recent development of this region with respect to its wines. This is an area with a very specific climate: it is near the sea, but also suffers the influence of the mountains of Espinhaço de Cão, Caldeirão and Monchique (almost continuous mountain chain, that runs through the region, from the Spanish border to the Atlantic coast). The southern location and the mountain barrier that protects it from the cold north winds, ensures a dry climate, hot and with little wind. The region is demarcated since 1980, but only in recent years started to revitalize its wine sector. It began by replanting varieties of grapes, modernizing wineries, and new methods of producing wine have been practised. 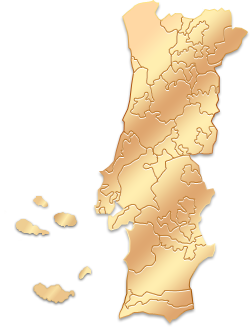 The Algarve region, due to the typicality that the soil conditions (sandy clay and shale) and climate give to the wines, originated four Designations of Origin: Lagos, Portimão, Lagoa and Tavira. However, most of the wine produced is part of the designation "regional wine of Algarve". At the time of the Discoveries, the wine production was important as it supplied the Caravels that left Sagres and Lagos. The Algarve, in the nineteenth century, was one of the few regions in Europe that resisted to the destruction caused by the phylloxera, because the vines are planted in sandy soil near the sea. Protected north by mountain ranges, the Algarve has a climate, a culture and a landscape very different from the rest of the country. A wonderful coast and a mild weather throughout the year, kept by the warm sea and by the winds that come from the North of Africa, make of Algarve one of the favorite tourist destinations in southern Europe. Faro, the capital of Algarve since 1756, was reborn several times over the centuries, after invasions, fires and earthquakes. It is worthwhile walking through the narrow streets in the old part of Faro’s town, along the marina and near the natural reserve, a lake delimited by islands. We recommend a visit to the Old Town, to the Archaeological Museum and to the Cathedral. 23 miles east of Faro lies the town of Tavira, full of historical churches and beautiful mansions with laced balconies, preserved from the disadvantages of mass tourism. On the other hand, Portimão, one of the largest cities of Algarve, is a "victim” of its excellent beaches. Extraordinary cliffs, the vast golden beaches and the estuary still wild of river Alvor, make Portimão a owner of a prodigal and beautiful nature. A visit to Alvor and the Fortress of Santa Catarina is recommended. In one of the largest bays of Algarve is Lagos, an attractive and busy city, which retains a great charm. Lagos, with its cozy historic centre, its pedestrian streets lively with shops, restaurants and outdoor cafes is an attractive and lively city. It is recommended a visit to the walls, to the Regional Museum, to the Infante D. Henrique Square and to the Santo António Church. Tavira, situated on the bank of a calm river, it’s an oasis of sweetness which contrasts with the frenzy and the bustle of other areas of Algarve. It is recommended a visit to the Moor Castle, to the curch Igreja da Misericórdia and the palace Palácio da Galeria. 5 miles West of Faro, +351289800800. More infor. : www.ana.pt.. Connection to the Islands Deserta and Faro, +351 91 7583621. Faro Station, Largo da Estação / Tavira Station, Largo Santo Amaro, +351 281 326394 / Portimão Station, 15 yards from the town centre, +351 282 415473 / Lagos Station, Estrada Meia Praia, + 351 282 762987. More info. : www.cp.pt. Tavira Station, Rua de Pelames, +351 281 322546 / Portimão Station, Largo do Duque, 20, + 351 282 418120 / Largo do Duque, 20, +351282418120 / Lagos Station, Rossio de São João, +351 282 762944. Lagoa: From the city of Porto , take the A1/Lisboa, take the exit for the A10 towards Benavente / Algarve , follow signs for A13 / Algarve / A2 / A6 / A12 and turn onto A13 , follow signs for A2 / Algarve / Alcácer and turn to A2 , take exit 15 to A22 towards Lagos / Portimão / Albufeira and take exit 6 for N124 - 1 towards Lagoa. From Lisbon take the A2/IP7 , continue on A2 , take exit 15 to A22 towards Lagos / Portimão / Albufeira and take exit 6 for N124 - 1 towards Lagoa. Lagos: From the city of Porto , take the A1/Lisboa , take the exit for the A10 towards Benavente / Algarve , follow signs for A13 / Algarve / A2 / A6 / A12 and merge onto A13 follow signs for A2 / Algarve / Alcacer and turn to A2 , take exit 15 to A22 toward Lagos / Portimão / Albufeira and take exit 2 towards N125 / Odiáxere / Zona Portuária Lagos Este. From Lisbon take the A2/IP7, continue on A2 , take exit 15 to A22 towards Lagos / Portimão / Albufeira and take exit 2 towards N125 / Odiáxere / Zona Portuária Lagos Este. Tavira: From the city of Porto , take the A1/Lisboa , take the exit for the A10 towards Benavente / Algarve , follow signs for A13 / Algarve / A2 / A6 / A12 and merge onto A13 follow signs for A2 / Algarve / Alcácer and turn to A2, converge with A22 and take exit 16 for N270 towards Tavira. From Lisbon take the A2/IP7, continue on the A2, converge with A22 and take exit 16 for N270 towards Tavira. Porta Nova Dock, connection to the Islands Deserta and Faro. Rua da Misericórdia, 8, Faro, +351 289 813731 / Rua da Galeria, 9, Tavira, +351 281 322511 / Rua 5 de Outubro, 10, Portimão, +351 282 430165 / Largo Marquês de Pombal, Lagos, +351 282 763031.